If an archer was expected to buy all of their arrows up front, what is a reasonable estimate of how many arrows they would need throughout the coarse of a full Tyranny of Dragons campaign? Assume that we are not using the 50% arrow recovery rule and are instead using 0% arrow recovery. This would cost 150gp and weigh 150 lb. 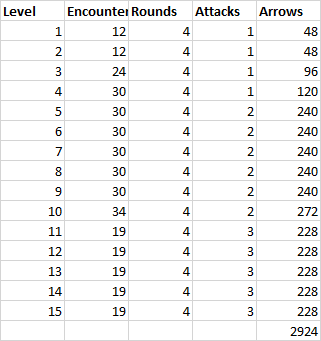 the number of encounters per level is as per my answer to Why does the experience-to-next-level not change between some levels? Now, the 357 encounters is possibly on the high side but if you do all the side-quests and have a lot of random encounters, I can see you getting there. Well, you can probably figure a normal fight runs four to six turns, and a big fight or boss battle might run twice that long. So multiply by the number of fights in the modules and the number of shots per turn, and you should be able to approximate it from there. But there isn't a fixed number of fights in those modules. It depends on how your skills roll out, how long you take, what you choose to do, and a lot of other things. I don't think it's possible to even vaguely approximate how many combat-rounds there might be across both modules because it just really depends. Not the answer you're looking for? Browse other questions tagged dnd-5e published-adventures hoard-of-the-dragon-queen rise-of-tiamat or ask your own question. Why does the experience-to-next-level not change between some levels? Where is the “Tyranny of Dragons online appendix”? What is the order in which published D&D 5e adventures should be played? How much cover does Wall of Stone give against a dragon's breath weapon if arrow slits are included in the wall?